what is your chow chow's weight? 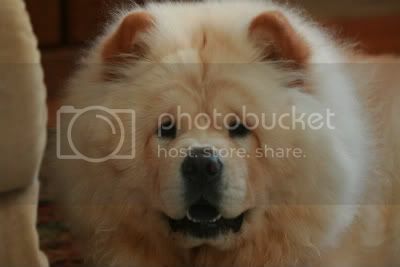 Re: what is your chow chow's weight? Yes I'm a nerd as i have all Winstons weights. 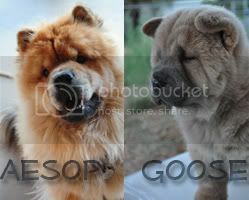 My chows are known for bone and substance and weigh between 70 lbs and 85 lbs. wowwwwwwwwwwww king is soooooo adorable, the second pic is so cute!!!! He does look like a king, with all his accessories and his attitude. Adorable! 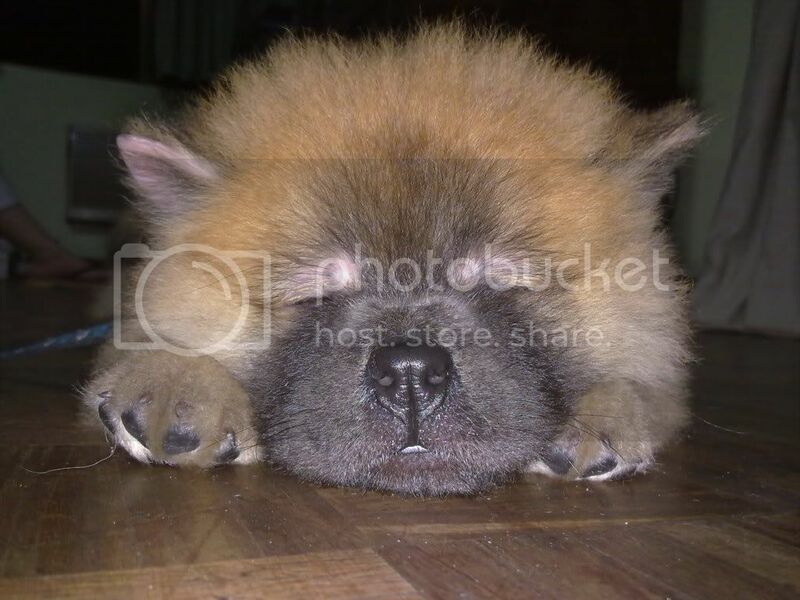 i have found a good indicator about how big your chow chow will get is the size of their feet and legs. years ago, when my father and I imported our chow chows from Austrailia, we noticed for 8 week old puppies, how huge their feet and legs were. My father told me based on my grandmothers chow chow raising, that the size of the feet and legs are an indicator of how large they will grow when they are adults. True to form! Aussie, our female weighed in between 85 to 90 lbs. Sam, the male was between 100 to 105 lbs. I had to take Lily to the vet monday, and Pip, my Chowder (Chow/Lab mix) came with because she was getting cabin fever. Pip will be 14 next month, and at her heaviest was 68 pounds. I put her on a reduced calorie diet, and she dropped to 63. She has been at 63 for the last 4 years, but I weighed her at the vet, and she was 57 pounds! I was so happy for her, and proud I kept up the regimen. It is not easy to get a breathing rug to lose weight! This is very interesting to read since I have worried about my chow's weight. He is 41lb at 14 months and has been the same weight for the last six months now. I've been so worried i've over exercised him but he's a superfit and healthy little boy, loves running fast and jumping high in the air, and is not interested in food. But now reading this I see they come in all sizes, I guess mine is just a smaller version (he was the last of the litter, perhaps that has something to do with it). and now at 23 weeks: 49lbs!!!!! You've got an original type chow. They were bred to hunt, guard, pull, and herd, they were origanlly an all purpose working dog with intelligence and a lot of energy. My Firesong is just like that, she eats about 2.25 cups of food each day, chases everything, barks at every noise, shadow, or suspected noise she hears. She will sit, stay, shake, give me five, lay down, go back, go up, up, come, turn, find her brother and a lot of other stuff. I work to keep her weight up to 40lbs, she'll drop to 37 or lower in a heartbeat. She is almost 10 years old and the only slowing down she's done is she doesn't pull on her leash any more, unless the squirrel is "right there mom, it's right there!" My Dreamdancer is a male version of the same, he eats the same amount and barely weighs 37lbs, I'd love to get him to 42 or 45...but I figure he has to calm down a little, I'll give him another 5 to 6 years to do that, he's only 4 and yeah he chases everything too. Loha, at 3 years and 3 months is a trim, athletic 61 lbs. Bella is a shortcake - weighing only 45lbs at 2 yrs old but Chumley, now he is gonna be huge (hopefully), at 6 1/2 months he weighs 61 lbs. In my experience, puppies will gain weight quckly up to 6 months then weight gain slows down and they fill out. The bigger the chow the longer it takes until completely grown. 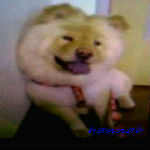 I had one chow who was right at 80lbs but it was 2 years before he reached that. Lobis Cunami is still at 56 lbs and Teddy 46 lbs, they been the same weight since their 1st Birthday last December. ROSCOE's 2 months and 1 week. He's a brown/cinnamon compact chow. He was released to me at 6 weeks and had a respiratory infection and was put on antibiotics and had mange. He's recovered now and the spread of his bald spots have stopped. His appetite has increased immensely and is now very active and energetic. Being in the Philippines, most of the puppies are ill until they find a good home. At 6 weeks, he weighed 1.6 kg. (3.52 lbs.). at 9 weeks, 3.2 kg. (7.04 lbs. He's growing fast and gaining weight too. He eats Solid Gold WolfCub large breed puppy food and he gets about 4 cups a day with some treats from training sessions. He's always hungry when I feed him so I don't know if I should decrease his food intake? My vet says that puppies should eat as much as they want while they are growing unless they get to be overweight... so far he hasn't said that my chow is overweight but its also been about a month since he's inspected him... hmm so what do you guys think? Hmmm, well, at 35lbs he doesn't sound overweight, but the fact that you can't feel his ribs, which you should be able to do is worrying. A puppy's bones are growing and soft and his joints can be damaged if he is too heavy at such a young age. I'd like to know his activity level. Do you walk him, does he have time and space to do "Zoomies" to rough house? Also I've had chows up to 73lbs and not one of them has ever eaten 4 cups of food in a day, the most was 3.5 and that was my big boy and home made food, on kibble it has always been 3 cups or less. Also how are you feeding him, once a day or twice? At his age he should still be eating twice a day, this will help him not over eat. And while Solid Gold is a great food, (my puppy also grew up on it) I mixed the WolfCub large breed puppy with Milenium adult. Chows aren't actually large breed, they are medium breed, and it would be so nice if someone would figure out a medium breed puppy food, but so far they haven't so a mixture of large breed, and regular, or just regular puppy food is best, I think. My puppy, (who is now four years old) is a little guy, he's approx. 40lbs now. At six months a puppy is at 50% of his adult body weight, (according to some charts I've read and stuff in the health section of this site) Your guy may end up at about 60lbs, a nice average weight for a male chow. I've had five males and when I average out their healthy weights it comes to 58.4lbs. Biscuit was 3 months old yesterday-vet appointment today and she weighed in at 21lbs. Our Bear is 11yrs old and weighs 26Kg. Jet is 12weeks and is 9.8Kg. He is eating slightly less than 4 cups of food per day and would eat more if you let him. He has legs like tree trunks and seems to be growing in front of our eyes.